Several species of wood wasps/horntail wasps are occassionally found infesting structures. They are most easily identified by the large ovipositor (egg laying organ) of the female that resembles a stinger. Most common Northwest species such as Sirex juvencus and Urocenus californicus are a bluish black in color, about ½ to 5/8 inch in size. 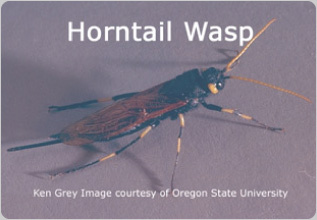 Horntail wasps do not infest seasoned wood but lay eggs in dying or recently felled trees. Typically they infest softwood timber, particularly in fire-damaged areas. The larva produce a course, tightly packed frass. Exit holes left by the wasps average 1/6-1/2 inch in size, depending on the species. These wasps are usually found in structures where infested wood is used in construction. The typical life cycle averages two to three years, hence it is possible for adults to emerge some time after the home is built. Additional academic information on these wood infesting pests can be read by clicking here. Corrective measures: Since these wasps do not reinfest seasoned wood, it is rare for corrective measures to be applied. These wasps typically do not bite or sting; however, a homeowner can apply a general use insecticide to them if they prove to be a nuisance. Adult emergence typically occurs in small numbers. While carpenter bees are more of a problem in the foothills and mountains of California, carpenter bees have been known to infest structures in the Rogue Valley in southern Oregon. Depending on the species, they may be all black or a combination of yellow and black. Carpenter bees resemble bumblebees in shape and size; the distinguishing difference between the two is that carpenter bees have a bare, shiny abdomen as opposed to the hairy abdomen of bumblebees. Carpenter bees are also unlike bumblebees in that they are not social but solitary insects. 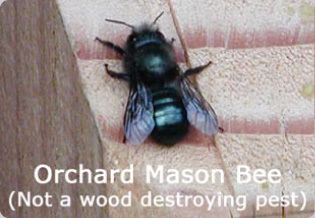 The female carpenter bee excavates unfinished wood (typically softwood) for nesting purposes. They produce a course, sawdust like frass. Exit holes are perfectly round and approximately ½ inch in size. The larva does not cause additional wood damage. New adults emerge in the late summer. If left undisturbed, succeeding generations can use the same nesting area for as long as 10 years. Areas normally attacked include unpainted rafters, roof eaves, wooden shingles, porch ceilings, window sills, etc. Corrective measures: Wood can be protected from infestation by painting (carpenter bees will not bore through painted wood). Where infestation already exists, Leupitz Pest Control can provide recommendations for eradication. A bee often confused with carpenter bees that occasionally infests the exterior of houses—particularly in the Willamette Valley—is the Orchard Mason Bee (Osmia lignaria). These bees do not cause damage to wood components. They are typically black in color and smaller than European honeybees. They will place pollen and lay eggs in cracks and crevices of exterior siding (a favorite area is under upper trim work attached to exterior vertically-grooved (T-111) siding) and then plug the entry with mud. Sometimes they will also lay eggs in existing abandoned wood boring beetle exit holes, thus giving the mistaken appearance of having bored the hole in wood. The larva will feed off of the pollen, and eventually transform through complete metamorphosis into an adult, emerging through the mud plug the following spring. Orchard mason bees are extremely beneficial insects as pollinators much like honeybees and, in general, are not aggressive. Some orchardists and home gardeners build various kinds of trap nests to cultivate orchard mason bee populations for pollination purposes.